What should I write about? Should it be about the puppy, who is now ripping my front door mat to shreds? (Not conducive to writing a SoCS post at all.) 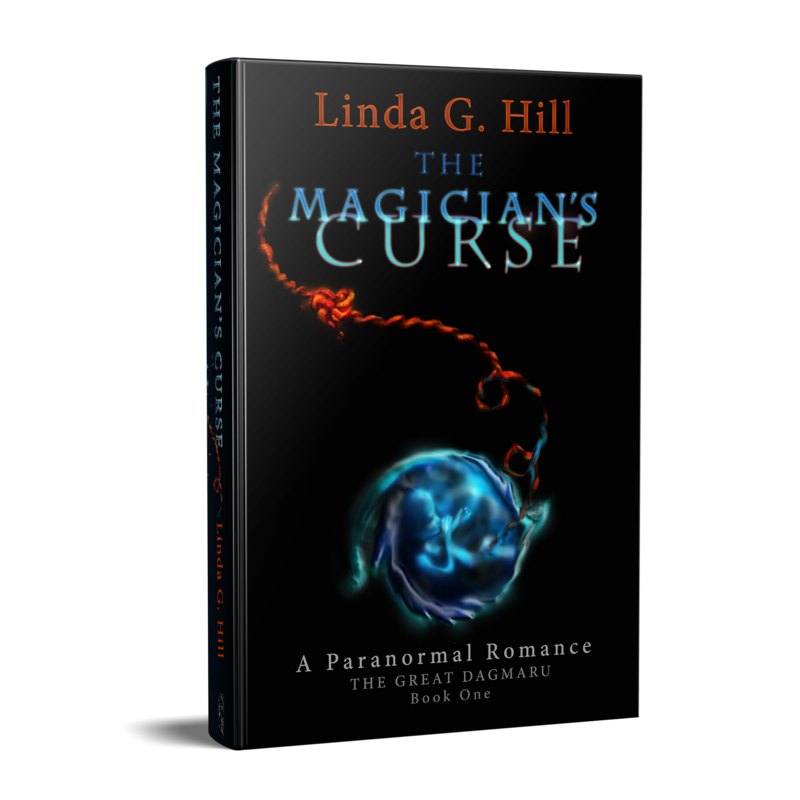 Or should I write about the fact that by the time this post is published I’ll be firmly ensconced in a hotel room, dreaming the night away? Yes, it’s my first night of sleep since November 29th. I’m looking forward to it. Should I write about… how nice it is not to have to listen to the TV when I’m sitting in the living room with my Deaf son while he’s watching whatever he likes? I’m surprised when the sound is on – that’s how often it happens. He’s really the only one who watches it. Ah, there are endless possibilities when the prompt is so open. It’s almost overwhelming, isn’t it? I sincerely hope that doesn’t sound conceited. I know I’m the one who came up with the prompt, but honestly I never have much of an idea what I’m going to write until I sit down to do it. Any more than you do. Hey, there’s a question – do you like the completely open-ended prompts like “what”? or do you prefer when it’s a more concrete one? Personally I enjoy the balance between the two. Anyway, my ex is on his way to watch the kids for the weekend. Unless his mom told him about the puppy (hi Lucie!) he has no idea he’s looking after an extra soul this weekend. Surprise!! Hehe. Word. The “what” prompt is brought to you by Stream of Consciousness Saturday. Click here to join in, and leave your link for everyone to see! 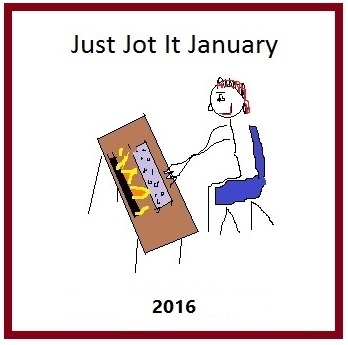 To find the rules for Just Jot It January, click here. Join in today! It’s never too late! And don’t forget to ping back your January 16th post here at this post. Note: If you combine SoCS and JusJoJan in one post, make sure you ping back to both this post and the Friday Reminder post. Categories: Blogging, Blogs, Just Jot It January 2016, Prompt, Random, Stream of Consciousness Saturday | Tags: family, fun, inspiration, JusJoJan, life, SoCS, WordPress, writing prompt | Permalink. Opened ended prompts like these are a little more challenging . But, i think it’s more in the spirit of stream of conscious writing. It’s really hard to plan a prompt like this. So it really is a sit down and see what happens type of thing. With other prompts even if you try not to plan , as soon as you read the word or object you kind of subconsciously start planning. I hope this weekend you get much needed rest. A day late, but I managed to finally post. Great post, Linda… I think I prefer something more concrete though. My post ended up sounding like a bad skit. Anyway, it was a challenge! Thanks! Think the sleep will be a good thing. Don’t know how you do all you do. Ah. So when you lie down you might have a problem getting up? Thanks, KL. 🙂 Looking forward to seeing what you write! I so totally hope you’ve slept well, and that you get to again tonight! Thanks Joey. 🙂 Last night I kept waking up, wondering where I was. Hopefully tonight will be better. Pingback: Just Jot It January: Day sixteen… | Diary of an Internet Nobody. 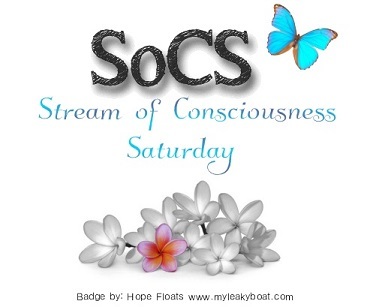 Well I’m new to the SoCS prompt so time will tell which sort I prefer. Oh yes I think I will be back for more! 🙂 Enjoy your break. I like the mixture of the two as well. Sometimes the limitless possiblities can be overwhelming, but usually it’s still loads of fun. Enjoy your time to yourself. Love how you end off this one. Thanks, Kerry. 🙂 Glad you enjoy the variations in prompts. Suffering from sleep deprivation myself – my cat is punishing me for a visit to the vet she had to have. That What prompt is lovely. Had something handy from some time back which fitted perfectly I think and I hope people enjoy. Hi Linda I hope you got away and that you ex did not bulk at the puppy :)!! I like both types of prompts the open ended ones are harder definitely! This week I had no idea what to write until I went to ‘blogs’ to start and found the format had changed Arrrrrrrrrrgh! Just a thought is there no mute button on you TV or remote! WordPress has changed something again? Ugh! How frustrating! Pleasure have a good time and take a deep breath when you go to your blogs. Puppys can usually win most people over! Well I hope you have the best time away, a weekend without TV and kids will be treasured I am sure. What about the handsome knight in shiny armour about to knock on our door? You didn’t mention him? Or is he just a figment of my imagination, well? It is hard to find what interest them. Pingu is a fairly new one for my grandson. He gets obsessed with something for a few months then moves on to a new thing. We can’t really influence him. He is very self willed. I hope you have a good rest on your night off. Caring for the disabled is very tiring. Yeah, it’s the same for my Autistic son. He’s 20 years old and has been getting stuck for months on a particular movie since he was 4. Thanks for that. I will tell my daughter. Trains is a recurring theme that resurfaces every now and again along with Thomas the Tank Engine animations. I guess we can expect this to recur again although he shows no interest in them at present. It is interesting to compare notes. Thanks for your response. I think over the years we’ve been through about five stages of Bugs Bunny… Of course all Autistics are different, but there are often a few similarities here and there. Woah, that’s a lo-o-ong time to go without a proper night’s sleep! I hope you enjoy it.